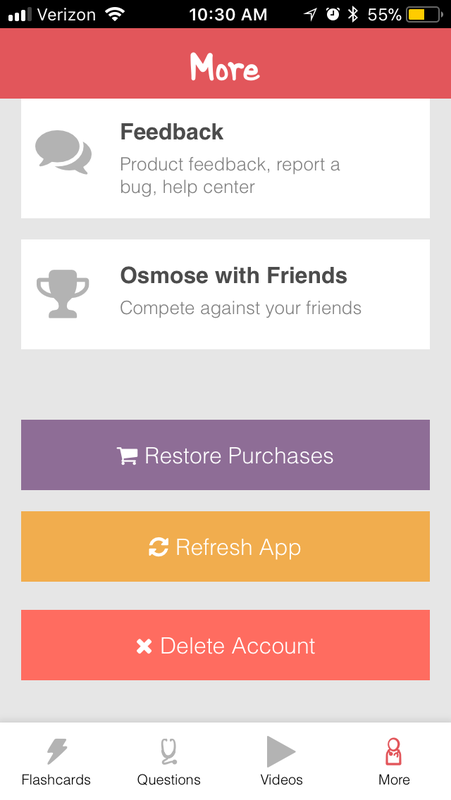 If you've purchased an Osmosis plan* from the iOS store and switch a device (without restoring from a backup) or delete the app, you will need to restore your purchase. *Note these purchases are not Osmosis Prime, which allows access to everything. These plans allow access to 1 section of the Osmosis library: Flashcards, Questions, or Videos, and is only available for iOS. We recommend purchasing Prime for long term value. Make sure that you are logged into the same Apple account and the same Osmosis account on both devices (make sure to double check your email on the device's Settings page and on the Osmosis More -> Account page). If both of those are the same, you should be able to tap "Restore Purchases". *Note: if you want to have an Osmosis Prime account through the website, it will work on all devices automatically (no need for syncing the Apple account) but we don't have monthly billing for that yet. Tap the subscription that you want to manage.If you're being charged for a subscription, but you don't see it in your list of subscriptions, it might be billed through someone other than Apple. Get help with subscriptions that aren't in your list.